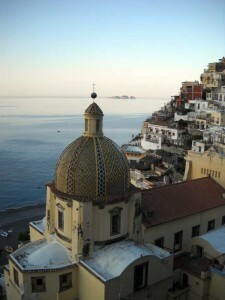 At the end of March, I returned to Sirenland, the writers conference in Positano, Italy. Last year I titled my blog “Sirenland – a writers conference in heaven,” and my opinion has not changed, in fact it was an even richer experience this second time around, perhaps because I spent (a little) less time with my mouth agape at the beauty of the view from my window…. and more time soaking up inspiration and ideas and support from the group. What I find so remarkable is that both times I’ve attended, the organisers and the three workshop leaders are completely ‘available’, even outside of workshop time and the other events. And because no one else is staying at the hotel, it feels very cosy but with this lovely glow, since the Le Sirenuse, where the event is held is one of the most beautiful ’boutique’ hotels in the world. I was in Dani Shapiro’s group this year and last year. She writes both memoir and fiction. I recently finished her memoir, “Slow Motion” and couldn’t put it down. She is a remarkable teacher and group leader, able to ‘evoke’ a whole novel from just 25 pages of submitted work, supporting the writer to find out where the strengths and weaknesses might be, and what to do about them. The quality of feedback from the other participants was, again, excellent. 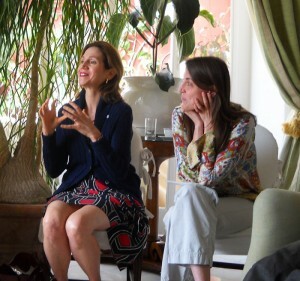 The other two workshop leaders were the inimitable Jim Shepard, and Susan Orlean who took the non-fiction group. 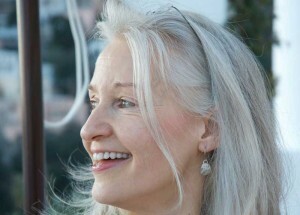 Jim once again brought his wife, the author Karen Shepard, and his two sons and daughter – all three talented writers. Dani’s son, Jake Maren again produced the highlight of our open mic night by writing and directing a play (Jake’s just turned 13). Hannah Tinti gave her exceptional talk on getting published and entertained us with her ukelele playing (and singing). Michael Maren, as always, made sure everyone and everything was alright, and made sure the event was captured on film (he took the photograph of me, below). All of the workshop leaders read from their work on other evenings, Jim Shepard choosing to read a new work, a flash story that had me weeping. I highly recommend this conference. I came away feeling supported and encouraged. Friendships were cemented or begun: people with whom I will be able to exchange writing feedback. This alone is such a gift. Both times I’ve left Sirenland feeling part of a ‘family’, one that will be there for me and for my writing in years to come. And it’s not just a feeling: after last year’s conference I stayed in touch with several of the participants, and received very helpful feedback on work that I shared with them. I do talk a little more about the general schedule of the conference my blog about it from last year, so if you want to know more have a read. Applications are open for next year’s Sirenland on September 15th. I returned home from Sirenland to find a letter from the Arts Council of Ireland informing that they had awarded me a literature bursary to help me complete my novel. Arts funding has of course been slashed in the past years, so I feel especially honoured and grateful. What a blessing, and great encouragement for the final leg of the work, which seems to get harder and harder the closer I am to finishing…especially as my mentorship with Marina Endicott from the Banff Centre’s Wired Writing Studio is now complete. I have to say I’m not sure I could have managed the long grey winter without Marina’s excellent guidance and editing. My weekly ‘date’ was sometimes the only thing that kept me from giving up on my novel – and myself! I’d re-edit a chapter and send it along to her, and receive back in a few days her comments and line edit suggestions. I would go through these and then work on the next chapter and send it off, and so on. The work she did with me brought my novel much closer to final draft, and taught me a lot about the process of editing a longer work. I am still in touch with some of the other participants from Banff, and hope to meet up in Toronto in July. I’m not yet at final draft, but close. I will be a guest writer at the 12th International Conference on the Short Story in English, June 27 – 30, but more about that in my next post. This entry was posted in Awards, Conferences, My Novel, Workshops and tagged Dani Shapiro, Hannah Tinti, Jim Shepard, Marina Endicott, Mentorship, Michael Maren, Sirenland by Sandra Jensen. Bookmark the permalink.